India enjoys a wide variety of local snacks, be it Gujarat’s dhokla to Ratlam’s sev, Indians simply love their snacks. Indeed, according to new research from the world’s leading market intelligence agency Mintel, three in five (60%) Indian consumers* eat snacks at least twice a day, while 15% of Indians are super snackers—snacking four or more times per day. The demographic profile of super snackers indicates that they are largely those living with their extended families (70%) and women (60%). 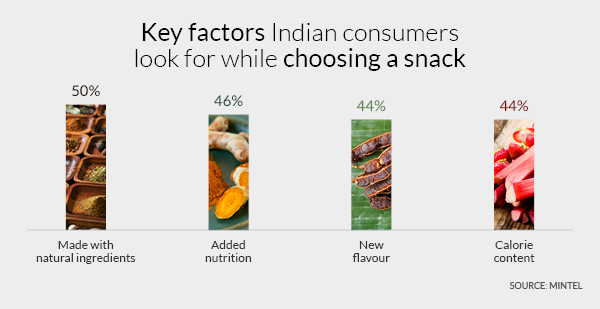 Mintel research reveals that health and nutritional benefits have become an integral part of the snacking experience, as half of Indian snackers (51%) wish there are more healthy snack options. Moreover, some Indians are justifying their snacking frequency by saying that they snack to control their weight (28%) and avoid overeating at meals (30%). There has been growing demand for products that fit lifestyle needs. Among snackers, over a third (36%) agree that they would like to have a better variety of conveniently packaged snacks, while one-third (33%) look for single-serving size packaging when choosing a snack. “Snacks have traditionally been a companion to TV viewing; given that mobile devices are the ‘new TV’, especially during everyday commute, this gives brands opportunities to develop on-the-go snacks. Furthermore, health guides many consumers’ life choices, and snacking is no different as Indian consumers are now looking at the functional benefits like added nutrition, lower calorie content while choosing a snack. Thus, snacks need to evolve and transform with these changing consumer lifestyles and habits,” continued Minu. Finally, Mintel highlights the potential for ‘snack drinks’ in India, as more than half of Indian snackers (54%) have used a beverage as a snack throughout the day. Moreover, over a third (37%) of consumers say that beverages make for good snacks. “Blurring the line between snacks and beverages can open up opportunities for ‘snack drinks’ like oats smoothies. These grain-based dairy beverages combine oats and milk, which are generally consumed during breakfast. Consumers can enjoy this on-the-go snack straight from the bottle, without the need to prepare or carry any additional cutlery for consumption. Mintel Trend ‘Transumers’ notes how consumers are looking for ways to maximise their time while in transit. Brands can look to explore wider opportunities for dairy drinks beyond the breakfast occasion, and instead, position them as an anytime, anywhere, on-the-go snack.” concluded Minu. Press review copies of Mintel’s Attitudes to Snacking – Indian Consumer – 2018 report and interviews with Minu Srivastava, Consumer Research Analyst, India, at Mintel, are available on request from the Mintel Press Office.